I missed typing!!! Yes I missed posting! I cannot tell you how frustrating typing is if limited to the left hand. I had a shoulder surgery and was confined to sitting around, watching without end NETFLIX series and waiting for others to help me, feed me, and brush my hair. I am so thankful for every helpful kindness during that time, especially when struggling to get out of clothes or into clothes. I cannot even stir with my left hand and I am so helpless in any respect. So this post even though a month old, long ago devoured, had to wait until my arm allowed to type again. Here it is: my birthday cake from Sophie! She was not quite sure if she understood me all right, ok since this has not been made in our home before, a tower of Mille Feuille combined with the freshest local strawberries bedded in creme Chantilly. Sophie made this pastry from scratch and that is quite a challenge, only recommended to those who dare anything, I would not know how to! You will be able to make it if you buy fresh pastry from the store, you might need two packages and a small ring to cut out the shapes. its not that easy to eat as you can imagine, so what we did is we ate the layers one by one. 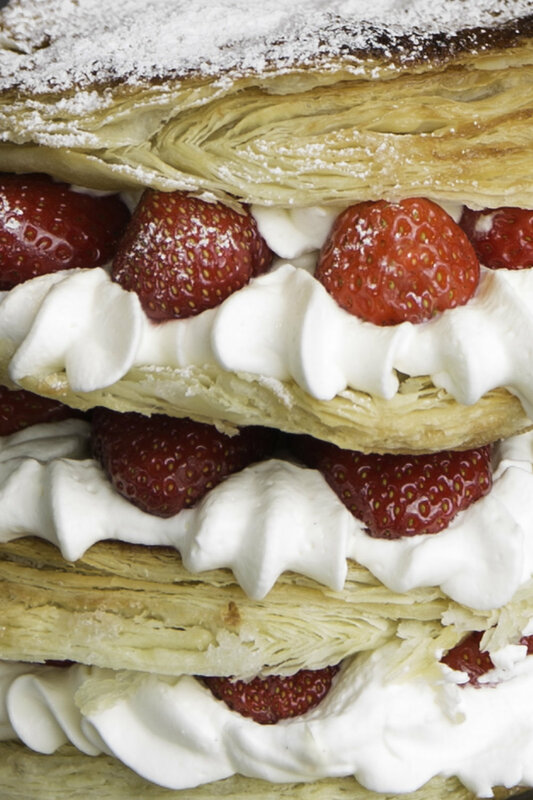 The crispy texture of the Mille Feuille the sweetness of those amazing strawberries exploding with sun ripe full flavor! And the cream! Maybe the recipe that defines summer the most for you! I am quite certain, that it might become the favorite of your Sunday desserts! Roll out the dough and cut 10-12cm in diameter circles, place them on baking sheets lined with paper. Bake until golden brown. Remove them from the oven and let cool completely. Whip the cream and season with your favorite ingredient. I love vanilla and lemon peel. Fill the cream into a piping bag if you love the cute swirls like I do. If that is too much of a task, you can as well spoon the cream onto the layers.